We’re wrapping up another productive week here at CSE with a solid list of the week’s progress highlights. If you missed today’s fairly colorful wrap-up with Tim and myself (Tyler), you can catch that HERE. We go over the Top Tenish items, and there’s a fairly “animated” Q&A ,with some of our awesome, and ever-inquisitive Backers. Let’s take a look at what we’ve been up to! WIP – Milestone Planning: Andrew’s visit to the WA office this week has provided some face time with our sister studio. It gave them an extra opportunity to cover planning on various systems and work on future milestone goals. We’ll be sharing some of these goals as a roadmap for Beta 1. Perhaps the best part of the plan is to make these goals fun to hit, using our Beta 1 scenario system. WIP – Tech – Google Cloud Platform: When we started down the adventure of making an MMORPG, there weren’t many options when it came to cloud hosting. That has changed, and we’re evaluating some other offerings. We’ve used Amazon’s AWS for a long time, and we’re investigating others, especially GCP, Google’s Cloud Platform. Supporting multiple platforms make us more flexible, with more choices for features and price points. Currently, GCP looks like a great opportunity to potentially do some really cool things for Backers who are located further away from our main hub (such as West Coast USA, Europe, Asia, and the Pacific) and save City State a bunch of money while doing so. All of this hinges on getting our code talking to their servers and testing it, and that’s what we’re working on now. Updated Database Ecosystem: A while back, we spoke about updating our database drivers. We’ve finally finished that task, and a bunch of servers were affected by the update. The initial rollout was for the Game Server, so any ITs who’ve joined us in a scenario have played on that tech. We’ve now deployed one of our other large systems, which is what we call the Ecosystem. The Ecosystem is the main web API for talking to our account system (the forums, store, and patcher all leverage the Ecosystem). This was the thing we were most concerned about deploying, because it’s responsible for your accounts, so we took a little extra time with it. We quietly deployed the Ecosystem this last week, and it’s happily letting folks log in, create accounts, and buy and upgrade pledges. WIP – Battlegroups and Warbands: Battlegroups and Warbands continue to advance with work from the ever-diligent JB. The API server work for real-time communication to the UI is currently in the bug-fixing stage. Once the API layer is finished. he can hook up the waiting UI layer. Then, once we get through initial testing, we can begin using these systems more effectively in our scenarios! WIP – Tech – Embedded WebAPI server: After completing healer NPCs and support for different NPC weapons, armor, and genders, Colin is working on embedding the WebAPI server for local builds. This will make it easier for devs to spin up local servers faster, improving productivity. WIP – Tech – UI Dev Real-Time Widgets: Currently in review: AJ set up a test SignalIR server, allowing the use of widgets that react to real-time events, such as group members joining or leaving. This also gave AJ more insight into ASP.NET, which our WebAPI and WebTools server use. WIP – Tech – Status Effect Icons: Rob has submitted code to send status effect info to the UI to improve combat readability, AJ is following up with the UI hookup, which will then need some work from Ben to show the different effects correctly. We’re testing basic functionality today. The goal is making sure players know what is going on and why, as a secondary measure to the animations, VFX, and SFX in game. This tech will help players know what is going on for now, before we get to more specific VFX and SFX permutations, later on during Beta. Generalize some global settings on the server to be scenario-specific. Improve projectile prediction between client and server. Supporting Ben’s update and debugging of abilities. WIP – Tech – Animation: Brad completed a first pass on hooking animations up to the scorpion siege engine. Characters no longer “dance” in place; now they move side-to-side when aiming and perform an animation when firing. We’re going to leave the more complex IK (Inverse Kinematics – arms sync with scorpion) tech for later. For now, we’ll improve the movement and timings, plus add a “load” animation. Additionally, Brad continues to improve readability of the animations system for faster development and debugging. WIP – Art – Animation: Scott has been quite busy this week. He’s roughing out a lengthy list of animations needed to incorporate focus items and casting into the one-handed weapon permutations. This includes different animations to show projectile, area, and self cast variations, as a general pass before we make more unique animations. WIP – Art – Animation: Sandra continues iterating on our weapon-specific shout animation for the polearm. We’ve gone through several iterations at this point. Our goal is to get the animation to hit its effect trigger frame quickly, have a strong animation following to convey the shout. Once this test proves out, we can work on other weapon and stance permutations much more quickly. 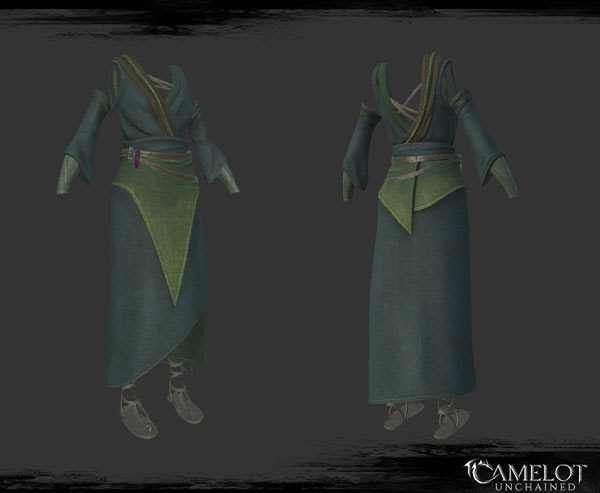 WIP – Art – Female NPC clothing: Jon had the unenviable task this week of unwrapping all three female NPC clothing sets, a very time-consuming task to do well. With that complete, he’s begun working on the materials, completing the Tuatha version, as can be seen in his livestream HERE. Art – Environment – Arthurian Boat: Dionne finished up the large Arthurian boat model this week. Check out the screenshots below! WIP – Art – SNS Patcher update: James and Michelle have been creating both styling and splash screen concepts this week to update the patcher for the scenario system. Check out the concepts below, as well! WIP – VFX/SFX – Combat Readability: For both Mike and dB, much of this week has been spent auditing the state of VFX and SFX. They’ve been making sure that healing and archery abilities are playing VFX, that SFX for things such as deflects are playing correctly, siege engine sounds are playing, etc. It’s a fairly broad focus right now, filling holes to improve combat readability that will continue into our next sprint. Once we can verify each ability is working as intended, we can begin making more class-specific visual and auditory permutations. WIP – Design – Updated Abilities: Making sure VFX, SFX, and animations are all playing with abilities, debugging abilities, and overall testing, puts Ben right in the middle of the chaos. Ben’s work ethic and technical prowess, and maybe his oneness with the universe, has helped him in this lengthy task updating, and improving, all the ability XML. This update deprecates old or obsolete syntax, groups several categories of abilities into less files, and simplifies our tagging method, making it easier to use and debug. As mentioned in today’s stream, much of this work encompasses feedback and improvements from our preliminary Deathmatch playtests, as well as upcoming tech and art for the scenarios that will take us into and through Beta 1. We continue to focus on making solid progress to the start of Beta 1, while rewarding Backers with more gameplay to make testing more fun. If you haven’t seen our update on SNS and the Dragon Circle detailing this, you can find info in our Beta 1 Document, HERE, or in the latest monthly Unveiled newsletter, HERE. Let’s move into art for this week, starting off with a different kind of art. Never one to ONLY work on three projects at once, JB has provided a screenshot of some HTML/CSS prototypes of inventory tooltips. For those of you who like stats and info, I’m sure you’ll love these! Next up, we have some WIP concepts. The first is from James for the Patcher styling, and the other is from Michelle for possible splash images, both for showcasing SNS and the Dragon Circle. Next up, the first pass of materials on the TDD NPC clothing from Jon. We finish off the art for the week with a nice beauty shot of Dionne’s Arthurian boat model. 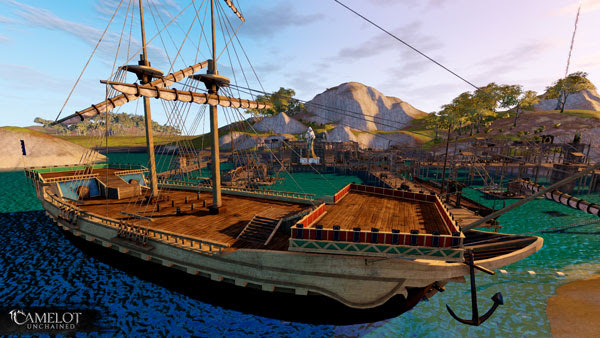 This and the background dock assets will help fill out the landing areas of the islands during Beta 1. That last shot of the boat simply makes me smile. It’s a shot that I hope makes the MMO explorer in you itch to get going. I’m personally looking forward to pulling these assets into some of the upcoming scenario zones. 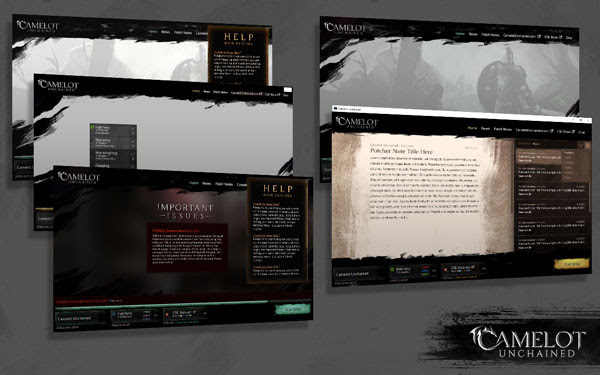 As always, we thank you for your support, patience, and interest in Camelot Unchained. We’ll CU next week!